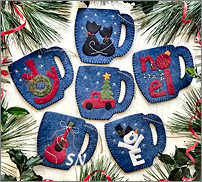 Rachels of Greenfield - (our little felt ornament kit lady) has a new set of 6 ornaments ready! Presented in complete kit format, each opens at the top for candy-cane or gift-card storage! A mug of steaming coffee, creamy hot chocolate or spicy tea... those treats warm your soul like these little guys can! 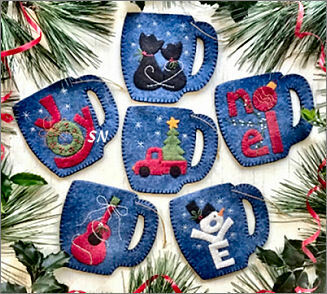 Kit includes the wool felt, floss, gold hanging strings, patterns and instructions to make the darling little blue, red, green, gold and white mugs! Easy stitching - no sequins! 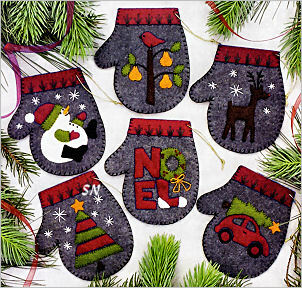 Oh we love the felt ornament kits we carry by Rachel's of Greenfield! 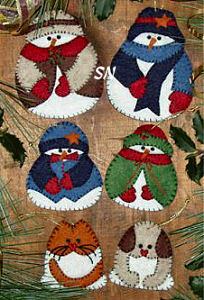 Primitive stitched felt ornaments... this is the 8th set that contains 6 designs... so there are TONS to choose from! Small 3 x 3-ish old-fashioned felt pieces, all you do is cut the shapes from the included wool, blanket stitch them together, and beautiful little creations are the result. 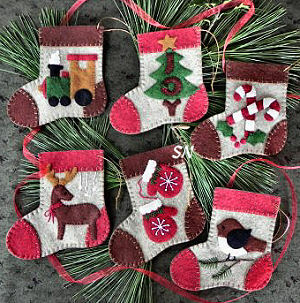 Remember the wool ornaments that used to hang on your family Christmas Tree? Here they are (minus the plastic sequins!) Gold string to hang them, full-sized cutting templates and all the correct sizes and colors of the wools, and flosses to add the small embroidery touches, these complete kits are good to go! VERY cute, this new set features a charcoal gray background on mittens with red cuffs. 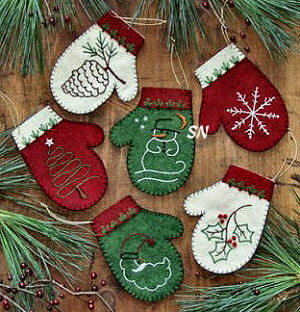 They join *Warm Hands* (more mittens), *Warm Feet* -- which are mini-stockings, *Snow Folks* -- which are snowmen (even a snow kitty and a snow puppy!) and the set of gift bag ornaments! 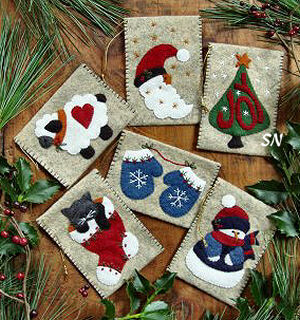 A new addition to our line of felt and primitive stitched ornaments by Rachel's of Greenfield, this kit brings us 6 old fashioned felt mittens made entirely of red and white. Offered as a complete kit of the red and white felt, floss, gold cord and patterns, each design is an iron-on transfer... you embroider with Straight Stitches and a couple of French Knots... then Blanket Stitch the fronts and cuffs to the backs, and you're finished! 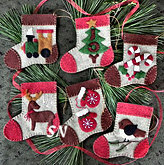 4 x 4-1/2 in size... so darling on an old-fashioned Christmas tree, these are so much fun to make! Perfect projects for beginning stitchers, or something easy to take a 'stitching break' away from something else more involved! 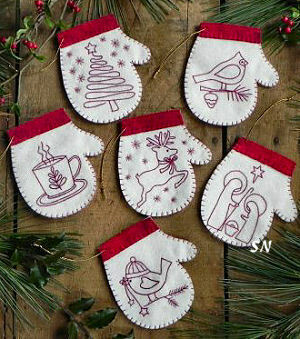 We have a delightful collection of these felt ornaments -- take a look! 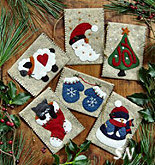 Felt Christmas Ornaments and Mini-Gift Sacks! Ornaments Galore! 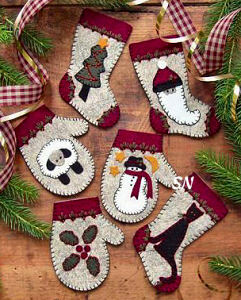 We have 6 new kits to make a total of 36 different mini stockings, mittens and gift bag ornaments! Something fun to hang on the tree, each and every one of these measures approx 2 x 3 when finished. 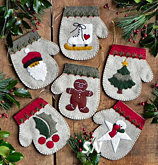 Traditional designs in classic reds, greens, navy, black and white, each kit contains its templates and pattern shapes with cutting instructions for all the ornament pieces. They also include all the felt, threads, beads and button embellishments (if any are needed) and the gold cord hangers! 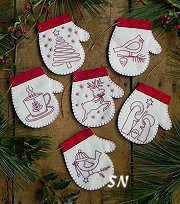 You'll do simple Blanket Stitches and a couple of Straight Stitch Holly springs, and attach a few beads, but that's it!! REALLY CUTE, the snowmen wear a 'backpack' back pocket to store treasures! (Maybe for Christmas $$?) Very small and quick... these might be good for a scout troop project... they'd be so retro and fun as a large collection on a tree, cute package ties, you decide! Buy all 6 and get a discount! Warm Hands is a set of mittens. Warm Feet is the set of stockings. 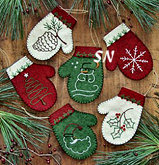 Christmas Woolens is a mixture of mittens and stockings. Mittens is a set that features only backstitch embroidery rather than blanket-stitched motifs. The Gift Bags are a perfect size for gift cards. Snow Folk have pockets on the back to hold money! The little dog and cat in that set are about half the size of the snowmen -- just precious!